YMCA takes pride in being able to offer opportunities for youth in our community to build strong self worth, a sense of belonging and have a whole heap of fun along the way. Youth Programmes at the YMCA range between education, recreation, mentoring and internships. 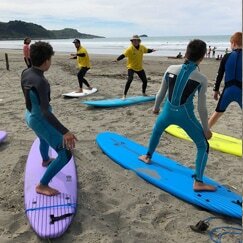 We provide ongoing help and support through various programmes like ALTERNATIVE EDUCATION for those who don’t fit mainstream Education curriculum, RAISE UP youth mentoring and leadership building, BREAKAWAY youth Holiday Programmes and OUTDOOR RECREATION opportunities to learn kayaking, surfing, stand up paddle boarding and work with our local Department of Conservation. We also offer placement in our ADULT NUMERACY & LITERACY programmes for those transitioning to a higher education. A weekly class run between 9am-3pm each day, providing secondary education for students who may not fit into the current school curriculum and are struggling to stage engaged and focused in mainstream environments. This is currently run through Lytton High School with referrals going through their admin department. Pick Up and Drops off are provided along with lunch and community opportunities like our DOC pest control programmes, health and fitness modules, unit standards and recreational activities off site. A fantastic FREE Holiday programme offered at 3 locations during the Summer and Easter School Holidays. 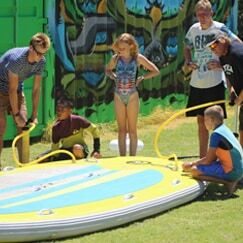 Breakaway caters to ages 11-17 years providing opportunity to learn surfing, kayaking, stand up paddle boarding, unlimited water fun at the OLYMPIC and ILLMINSTER school pools all for FREE with a daily sausage sizzle. 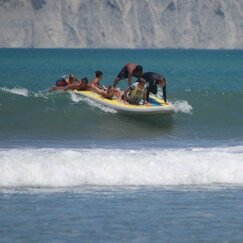 Registrations are limited and are available 2 weeks out from the start of each holiday period. Currently run once a month at OSCAR RECREATION HOUSE, our Raise Up Youth programme engages youth aged between 11-15 in leadership activities, team building and strength discovery activities, designed to build confidence and self expression in a safe, fun and friendly environment. RAISE UP runs the last Friday of each month between 6-9pm with drops offs home provided and a snack to keep the hunger pains at bay. Adult Intensive Numeracy and Literacy provides education to help you with everyday tasks like budgeting, paying bills, CV and job interview skills, assistance in job application, computer skills and ongoing support throughout your adult education journey. Run by a qualified teacher, you will gain unit standards and value tools that you can put into place and use everyday.